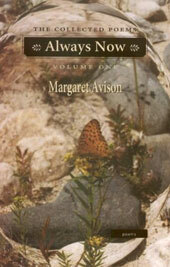 Always Now, Collected Poems of Margaret Avison, encompasses in three volumes all of the published books, from Winter Sun (1960) to Concrete and Wild Carrot (2002), and is framed by a gathering of uncollected and new poems respectively. When complete, Always Now will present all of the poems, up to 2002, that Margaret Avison wishes to preserve. Volume One extends from the uncollected poems to Avison’s translations of Hungarian poems, and includes Winter Sun and The Dumbfounding. Besides the uncollected surprises, two of them dating to high school days and first published in Hermes, Toronto’s Humberside Collegiate literary magazine, there are the loved and familiar early poems, just as fresh now as they were then, from which certain wonderful lines still jump out: ‘Nobody stuffs the world in at your eyes./ The optic heart must venture’; ‘In the mathematics of God/ there are percentages beyond one hundred.’ Margaret Avison’s poems have warmed the hearts and enlarged the thinking of two generations of Canadian readers. Until Silenced: To I. A. 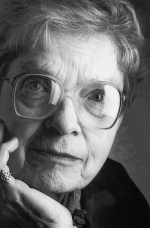 ‘The poetic genius of cold weather is Toronto poet Margaret Avison, whose work hooked me in my thirties and has never let go. Poems like Snow, New Year’s Poem, Thaw, Banff and Death, which first appeared in Winter Sun (University of Toronto Press, 1960), have now happily reappeared in Always Now, the first volume of her collected poems (Porcupine’s Quill, 2003).